Asociacion Turismo Comunitario Machay, we are an organization focused on offering community tourism since with all the arrivals we arrive we preserve the paths and we grow our community more. El Paraíso de mi Familia hotel is the perfect place to stay away from annoying noises and at the same time being close from main touristic locations. We are located in a privileged area of the Tena City, 3 blocks from the land terminal and on the main avenue. Bijao Restuarant offers its distinguished clientele, national and international, a select gastronomy that fused with an Amazonian environment and you can rest from the noise and chaos of everyday life while enjoying your vacations in this city. 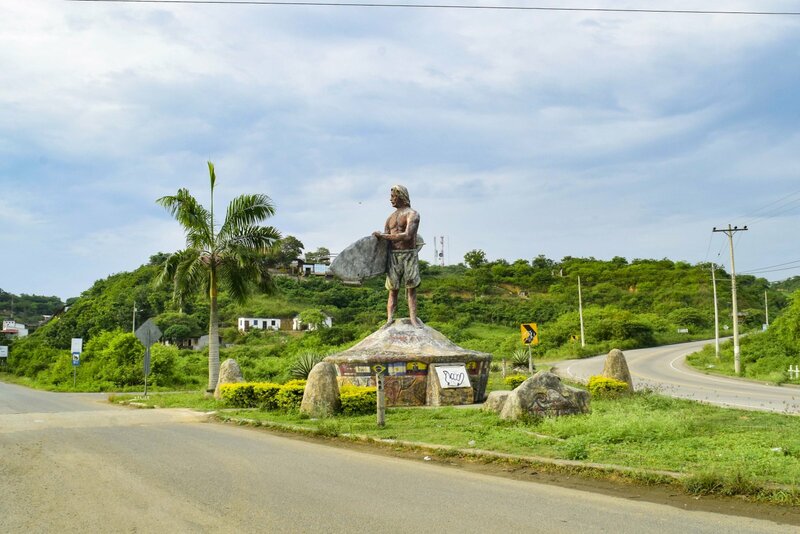 A huge stone surfer welcomes travelers who decide to visit Montañita, a small town on the Ecuadorian Pacific coast. This beach is very famous worldwide because of the party atmosphere it offers and its huge waves. For these reasons, it receives visitors from all over the world. Argentine, Chilean, and Colombian dialects mingle with those of travelers from other countries who do not speak Spanish. The hotel option in Montañita is very varied, you can find rooms from USD 5 to USD 40 depending on the season in which you travel. But if something really draws attention in this place - besides the waves - it's your nightlife. At night this beach -located in the province of Santa Elena- shows its best face to tourists who can choose between a wide range of bars and nightclubs to spend the night. Between 9 and 10 pm the weather starts to turn on in the town, tourists are ordered at the exit of the boardwalk to choose which will be the best alternative to have fun or eat something before starting the party. The gastronomic offer is endless: traditional Chilean empanadas, Italian pizza bread or typical food of the Ecuadorian coast are the dishes that travelers can choose from. For those who prefer another type of entertainment, the option can be a walk along the sea. When people see the name of the Australian AC / DC band drawn on the front door they know what they will find inside. Drum beating, bass drumming and guitar solos welcome tourists at Bier House, Montañita rock bar. This is perfect for tourists who prefer the heavier rhythms to spend the night. Montañita is a surfer town that has received people of many nationalities and musical tastes very varied. A large group of rockers also lives in this town, they put the different atmosphere in Bier House. The place is decorated with images of rock icons such as: Black Sabbath, Metallica or guitarist Jimmy Hendrix. Admission to this bar is free and a beer costs around USD 2.50. Between capoeira and trendy music the Hola Ola bar welcomes its visitors. 200 meters from the beach this place rises, a wooden construction typical of Montañita. In the morning Hola Ola is a bar - restaurant that has a varied menu that offers food from the Ecuadorian coast and foreign dishes. At night the atmosphere is lit in this place that is located on the main street of Montañita and is the most popular area for tourists. The cost of entry is around USD 5, depending on the time of year (high season or low season), as in all bars in the area a beer can be found at USD 2.50. From the beach, in front of the Malecon de Montanita you can see a huge construction that mixes the concrete with the bamboo. This place works as an ecological hotel, like many more in Montañita. But at night the high volume of music in Nativa Bambú sets the pace on the beach and on the boardwalk. Located in front of the sea, this amusement center is full of lights of all colors that illuminate the night in this coastal town. From the beach you can listen and see that the atmosphere of the Nativa Bambú nightclub is the best of the town, this is confirmed by the official tourist page of Montañita. In high season the price of admission to this disco is USD 5. There are more options in Montañita for nighttime fun, one of which is to buy a beer in the shops near the beach with a value of USD 1.25 or a cocktail in the street stalls at USD 2.50 and sit facing the sea . Another alternative is to sit outside a bar or a disco and listen to live music that is very common in the locals of the region. What to take to Montañita? Money in cash, in Montañita there are two ATMs but in high season access to them is very difficult and it can take hours to get some money. What to eat in Montañita? The great cultural and national diversity that exists in Montañita means that the gastronomic options are very varied. The Argentine empanadas at the entrance of the town at USD 1 or a fruit shake at the stands near the beach at USD 2, are meals that tourists can not fail to try. How to get to Montañita? There are several bus cooperatives that have routes to Montañita. From Quito the best option is to take a bus to Puerto López (the price of the ticket is USD 10) and Puerto Lopez take a bus that will take you to Montañita in an hour (the price of this transport is USD 3). The trip between Montañita and Guayaquil lasts three hours, from the land terminal of Guayaquil daily routes to Montañita, the value of a passage between Guayaquil and this beach costs between USD 3 and USD 5, depending on the bus company.